Momentum provides Mechanical, Maintenance, Sales and Hire services for the Material Handling Industries. 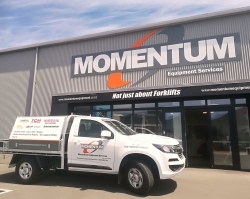 Momentum is part of the Thwaites Group which comprises of both Thwaites Diesel Nelson and Momentum Equipment Services Ltd. Momentums' philosophy is to provide and maintain high quality assured client/customer support 24 hours a day, 7 days a week, 365 days a year. We cover the Top of the South Island - Nelson, Richmond, Motueka, Golden Bay, Marlborough, Blenheim and Westport. Momentum has a mobile service fleet that provides full service facilities on your site. 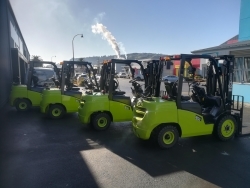 Momentums' strong presence and growth within the market place has seen it attract an enviable brand portfolio: Nissan/UniCarriers, Jungheinrich, Yale, Hangcha, TCM, Utilev, EP, Combilift and GenieGrips. All our services are backed by our professional and qualified team of dedicated employees, including technical resources across Asia-Pacific enabling us to meet all of our customer needs. Momentum also operates a Traction Battery Division that provides maintenance, repairs, testing, desulfating as well as leasing of batteries for our battery electric forklift customers. For more information on Momentum's products and services, click to visit the website. Your enquiry has been sent to Momentum Equipment Services.